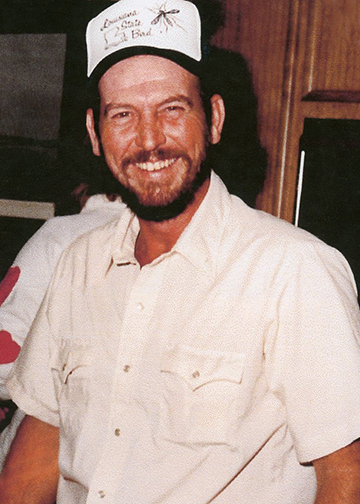 Rufus Patrick "Pat" Evans passed away at his Beaumont, Texas home on February 4, 2019. Pat came into this world on February 14, 1949, in Houston. He was the youngest of five children (and the only boy child) of parents Rufus Washington and Wilhelmina Stiebing Evans, both deceased. Pat and his wife, Linda, are members of St. Anne Catholic Church, Beaumont. He was a United States Army Veteran and served from 1970-1971 in Germany and Italy. Pat was a talented and life-long contractor and carpenter in Beaumont and surrounding areas including the Bolivar Peninsula. He knew about Crafts and could repair most anything. Pat loved fishing and being out on the water and helping the family gather honey from the wild bee hives. He mischievously loved to make people laugh with his jokes and stories. Pat and Linda built their Beaumont home, which was completed in 1999. Memories are plentiful of family gatherings there to help complete the work with barbecues and crawfish boils to finish off the working day. Pat will always be remembered for his generosity in helping others with their own projects. Pat is survived by his wife, Linda Green Evans; son, Bobby Lee Brasuell and his wife, Candace; and granddaughter, Electra Eleela Brasuell, all of Beaumont; grandson, Cody Arnold, of Hamshire; sisters, Jean Evans Hardy Pittman of Alpine and Mary A. "Cookie" Evans Brown of Beaumont; and many nieces and nephews in faraway places. He is preceded in death by his son, William Lynn "Tinker" Brasuell; and beloved sisters, Elizabeth Karlene Evans Wheeler and Catherine Anne Evans Daugherty. All are invited to the Funeral Mass of Remembrance at 10:00 a.m., Thursday, February 14, 2019, at St. Anne Catholic Church, 2715 Calder Avenue, Beaumont. Immediately after all are invited to share a meal with family at the Elks Lodge, 11431 US Hwy 90. There will be a short service "In Memory of Departed Elks". In lieu of flowers, donations may be made to the St. Anne Catholic Church, Flowers of Remembrance Fund, 2715 Calder Avenue, Beaumont, Texas 77701. They will be placed on the Altar at a Sunday Service on a week to follow. Cookie, just saw this obit when searching for someone else's. So sorry that I didn't know in time to attend the service. Wish I could have visited with him one last time. But I'll always remember the fun times we had as kids and the tricks Patrick liked to pull on us girls. I'll be thinking about you today and hope you'll call me sometime. Linda.... We just heard about Pat today. Our hearts go out to you sweet lady. Every one loved Pat. Jeff and him ran up and down 11th street .in Beaumonttx in the early days.. Cherry and Jeff Alexander, Sour Lake, Texas. Pat was a dear friend to my family. He was instrumental in my childhood and as an adult. I will miss you dearly but I also know that you and my father are sharing some laughs and having a great time. THOUGHTS AND PRAYERS TO THE FAMILY. PAT WILL BE DEARLY MISSED. SO GLAD I WAS ABLE TO VISIT WITH HIM RECENTLY. My dear Aunts Linda, Cookie and Jean - you are all in my prayers. Uncle Pat lived life to the fullest and he will be missed. It comforts me to know that Momma was there to greet him. Big hugs for all of you as you journey this difficult time. Cookie, words are never adequate at times like these. God has a plan for each of us and we must Trust and Obey. I am in Florida training umpires but rest assured I am thinking of you, Patrick, and the rest of the family. God bless! .Rest in peace Pops. Thanks for all of the knowledge man, I will pass it on down the line. We are so sorry to hear your loss of Pat. Prayers to the family to help you thru this time. Roger and Judy..